Super Bloom Watch: Will the Rare Desert Wildflower Burst Return in 2019? 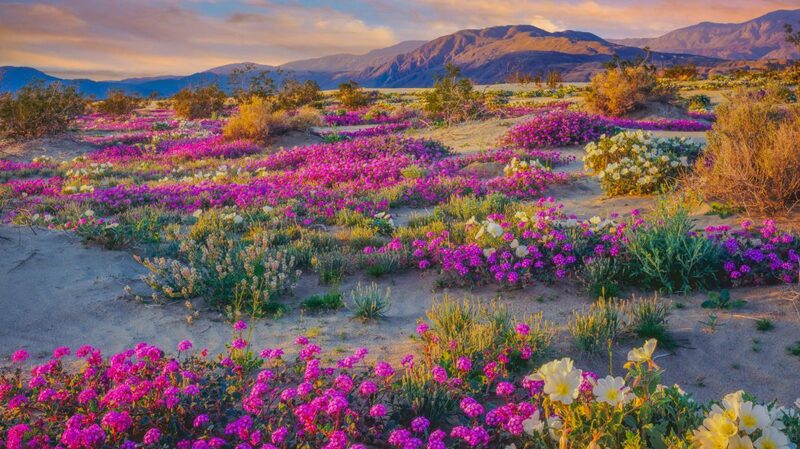 Anza-Borrego Desert State Park is expected to be carpeted in yellow, purple, and white wildflowers beginning in March. Some early pops of desert sunflowers, sand verbena, and desert lilies have already started to appear along the eastern areas of the park. While a sprinkling of flowers bud every spring, it can be years between super blooms. The last was in 2017, but before that, there had not been one since 2008. The rare and unpredictable nature of super blooms adds to the magic–but also the crowds. Borrego Springs, the town near the park, is a community of just 3,000 and Anza-Borrego is visited far less than Joshua Tree or other SoCal parks, so there’s less infrastructure for a swarm of flower gawkers. In 2017, some 200,000 visitors flocked to the super bloom, motivated at least in part by the fact that images of the bloom make for primo social media content. In coming weeks, the park will post updates on blooms to their website and also offers a Wildflower Hotline at 760-767-4684. The Anza-Borrego Foundation, an independent non-profit that partners with the park, also offers additional information about types of flowers to seek out and schedules guided spring plant walks throughout the season. Next articleIs Scientology Losing Its Celebrity Cachet?